What it does: Helps some acne sufferers, if they’re deficient in Vitamin A and D.
How to do it: Take 1-2 tablespoons a day, or 1-2 capsules a day. 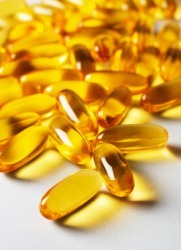 Omega-3 helps psoriasis, eczema, and other skin diseases. Omega 3 also helps prevent a whole host of other diseases (heart disease, cancer, depression, arthritis, Alzheimer’s disease, ulcers, diabetes, hyperactivity) It also increases your ability to concentrate as well as your energy level. Do you know a vegetarian equivalent? Hi Kate, flaxseed also has Omega-3 fatty acids. It’s a different type from those found in fish oils though and may not be as effective. If you’re interested in trying flax seed or flax seed oil for acne, there are quite a lot of reviews for it on the acne.org site at http://www.acne.org/flaxseed-oil-reviews/230/page1.html. Thanks for this post and Thanks Samantha for the additional info. I recently came upon a book about alternative medicines from a garage sale a couple of weeks ago and they also recommend Cod liver oil. A friend of mine used it and she showed a lot of improvement but it didn’t help at all that much with the scars. You guys better consider taking the oils for prevention rather than as a cure. I have been putting A & D baby ointment on my face every night and it has worked wonders for my acne. I just looked at the ingredients and the source of the Vit. A & D is cod liver oil! So it works topically too!